CHENNAI : The contentious issue of what we can do to help our farmers better their lot, found a lot of answers during a discussion on What we need to do to make India Incredible? at TNIE’S ThinkEdu Conclave 2019. The first panel of the day had NITI Aayog’s Amitabh Kant in conversation with PMK MP and former Union minister, Dr Anbumani Ramadoss trading ideas. 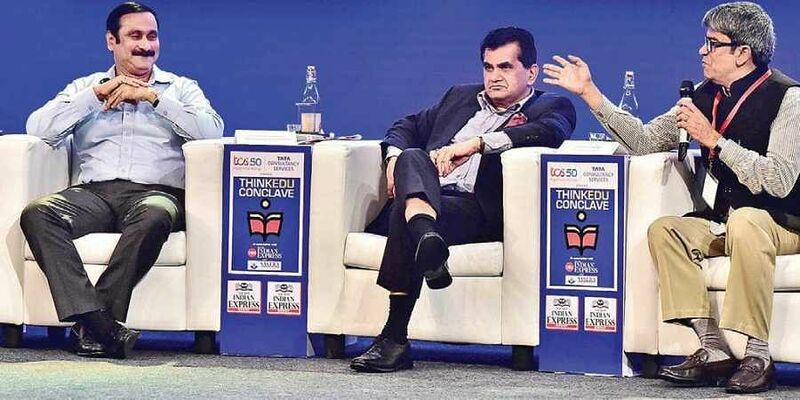 Perhaps the most candid and hard hitting one came from Amitabh Kant, who said, “My belief is that agriculture requires a lot of technology in India - the first green revolution was a result of that. Indian needs cold storages, warehousing and scrapping of the APMC Act to allow markets to work. (Currently) Markets don’t work,” responding to a question from a delegate on why India lags behind in produce per hectare when compared to a country like Israel. Kant took it a notch higher and upped the honesty quotient, when he said, “It’s not about education. There has to be political will by politicians like Mr Ramadoss and many more to allow markets to function so that producers get the right price. We have constrained our farmers too much by too many controls and that needs to be stopped,” he said. Ramadoss, who had done a lot of grassroot work with the farmers in his constituency, said that if the right price was paid for the farmer’s produce, he wouldn’t need any sops. “We need to respect farmers and give them their due. Somewhere the MSP has gone wrong, there is a huge gap between the produce and the price set by the government. He just needs the right price, not sops,” he said. “India produces the second highest amount of milk in the world, but less than 1 per cent is exported,” he said, pointing out the lack of proper storage facilities.Pointing out that Tamil Nadu’s tag of ‘most urbanised State in the country’ is because of high migration to the cities in search of jobs, Anbumani said that he would not consider it a sign of development. “Reverse migration is a sign of development for me,” he said, claiming that it would be possible only if the government makes agriculture a viable profession.